Title: A woman doing yardwork outside. Description: The woman pictured here was spending some time outdoors on a bright sunny Georgia day working in her yard. 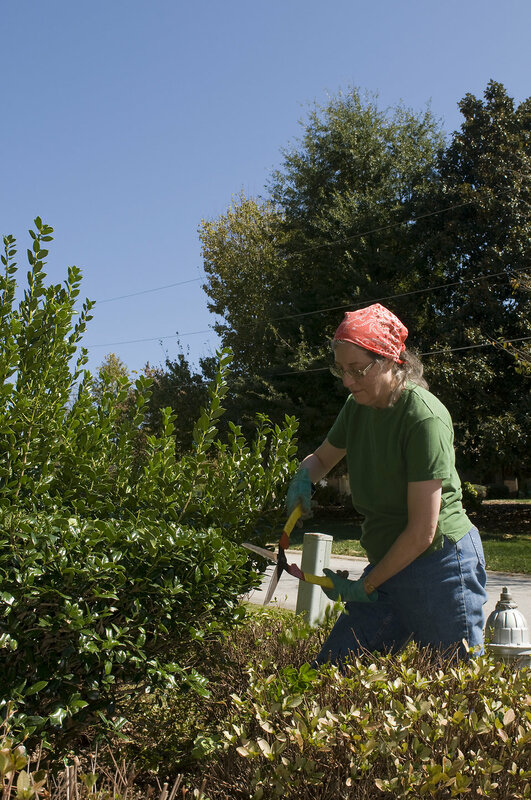 At this point in her activity, she was using a hedge-clipper to prune a low-growing shrub. She had applied sunscreen to her sun-exposed skin, and chose to wear a dark-colored t-shirt and denim pants, all of which would help to protect her from the sun's harmful ultraviolet rays. She was also wearing a pair of glasses, and a head scarf to protect her eyes and scalp respectively.